I know, I know, you are all tired of seeing us turn head-boards and foot boards into benches. I am neck-deep in benches at the moment. I have a slew of them to finish right now. I will try not to bore you with my progress on the benches, but this one is special. Today’s post is not about the bench. It is about the story behind the bench. Right now it feels like the garage is overflowing with head-boards. 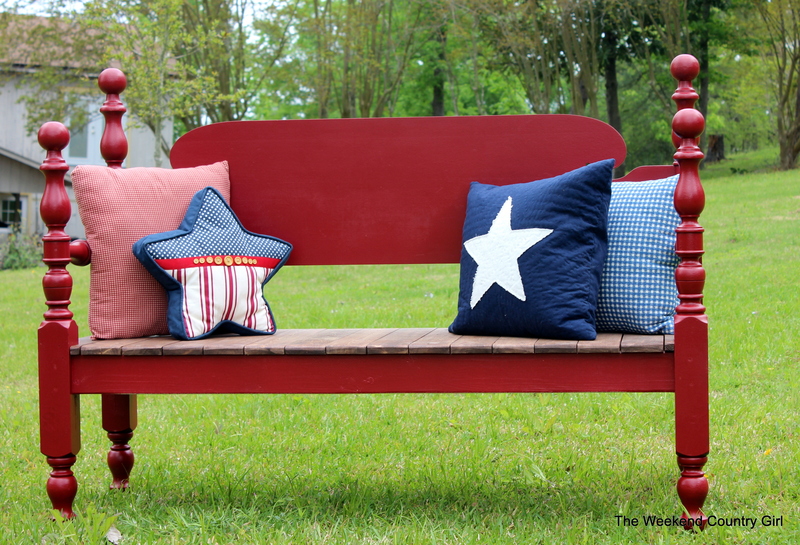 When we started making benches and I blogged about them, and sold a few. Because of the blog, a dear friend contacted me to ask me to make a bench for her from a bed she has had since childhood. I told her that of course we would do it for her, but I did not ask a lot of questions. I went to pick up the bed she showed me where she would put it, the color she wanted it… everything but the bed. When I finally saw the bed, I was a little surprised. It was one of a pair of twin beds that can be bunked. The bed was made of rock maple with spindles. The picture below is NOT the bed, because I was silly and forgot to get a picture, but it is similar. If I were in a thrift store looking for a bed I would have passed it up. It was a twin bed which is pretty small for a bench and all spindles. Oh, I love it already, and Brooklyn does, too…esp when I told her it would be red! I’m so excited because not only will this be beautiful and functional, but it was my twin bed growing up. I got bunk beds in 2nd grade (a cousin was given one of them years later). This one stayed with me, became daughter Lisa’s twin bed as a teen, and even spent a little time in my other daughter, Katie’s, college apartment. 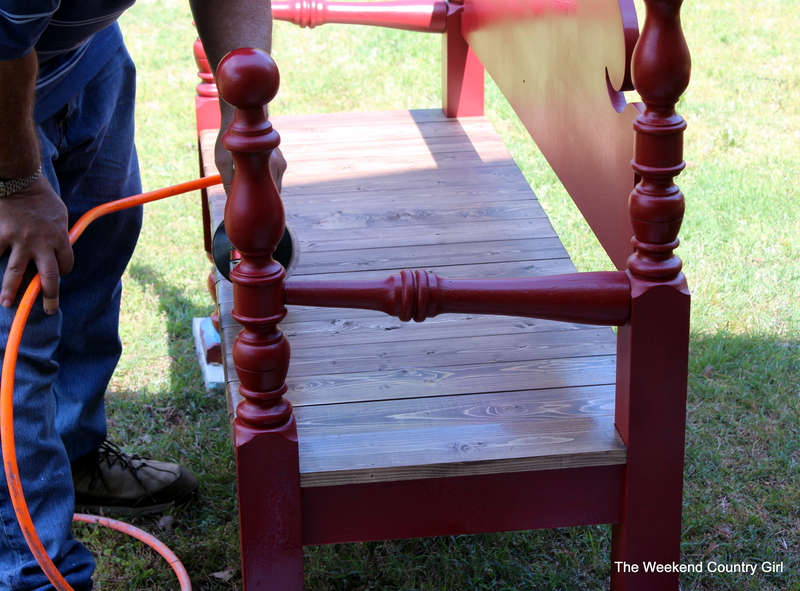 Lots of history and love going into this soon-to-be reading bench for my grandchildren…so lovin’ this! Red benches seem to be my “thing” right now. Behr Red, Red Wine is the color. She also wanted stained slats like the one above. This particular bench was a little tricky and we felt the pressure. If we messed it up, there would be no “throw it out and start over” plan. We took our time and worked it all out before starting. After a few weeks, we finished it. Working only on weekends is slow going. Here is the finished project. I think it turned out great, but remember the story in this sweet little bench is in the history. Hopefully one day Brooklyn will be able to tell her grandchildren about the bench and that it used to be her own grandmother’s bed. I would love to hear about a piece of furniture that is part of your history. My husband and youngest son just made me a bench from a twin bed I bought at Habitat. I have a twin bed in the basement that will be turned into a bench for our middle son. He and his wife just bought a home and we will give them a bench made out of the bed he slept in when he was little. What a special gift for your son and daughter in law. I am sure they will treasure it.